Chiropractic services to provide you with effective pain relief. Experience a fuller quality of life, and achieve your wellness goals. Hot Stone Massage is a specialty massage that uses smooth, heated basalt stones which absorb and retain heat well. The direct heat relaxes muscles, allowing manipulation of a greater intensity than with regular massage. In cases of muscular injury and inflammation, cooling marble stones are also used. The cool stones cause the blood vessels to constrict, stimulating the nervous system and drawing blood and waste products along the body. The warmer stones expand the blood vessels, pushing blood and unwanted waste materials through the body. This has a sedative effect on the nervous system. Chiropractic care is a health discipline and profession that emphasizes the diagnosis, treatment and prevention of mechanical disorders of the musculoskeletal system; especially the spine and nervous system. The main chiropractic techniques involve manual therapy (including manipulation of the spine and other joints), soft tissue treatments, as well as diet and exercise. Chiropractic can help by promoting overall good health. We have expanded our line of professional pain relieving products. 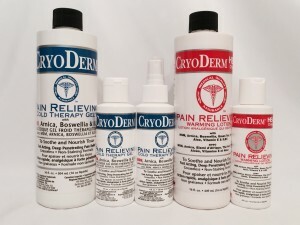 Along with CryoDerm Pain Relieving Cryotherapy we now carry CryoDerm Heat Pain Relieving Warm Therapy. CryoDerm Cryotherapy goes on cool, provides pain relief within minutes to treat a wide range of pain symptoms. CryoDerm Heat provides long lasting gentle warmth to relieve pain from muscle pains, strains, sore stiff muscles, arthritis, joint pain and more.